1. In 1900, Marie von Sivers, a gifted young Russian (who was to become the future Frau Dr Steiner), came to Berlin in order to make the acquaintance of Rudolf Steiner. Soon after meeting him, she asked him a question which had preoccupied her. They came to call this the Chrysanthemum Tea moment, because the room in which they were having tea was full of those flowers. She asked Steiner if there wasn’t a need to call a new spiritual movement into life, one which would be appropriate for Europe and the West, since the Theosophical Society contained so much Eastern spirituality. Steiner replied that this would only be possible if it could arise from the depths of esoteric Christianity. Thus was born anthroposophy. 2. On April 23, 1919, after a lecture Steiner gave to the factory workers of the Waldorf Astoria cigarette factory in Stuttgart, Emil Molt, the company director, asked Steiner to take on the planning and leadership of a new school for the company’s workers. This led to the birth of the first ever Waldorf school. 3. In August 1923, in Penmaenmawr in Wales where Steiner was leading a summer school, Dr Ita Wegman asked him: “Would it not be possible to found a form of medicine based upon the mysteries?” This led to their collaboration in writing a book and the beginnings of anthroposophical medicine. It seems as though an initiate can only bring something new to the world when requested to do so through an act of free will by another human being – the initiate cannot act to impose new ideas without the way being cleared by someone asking for them. 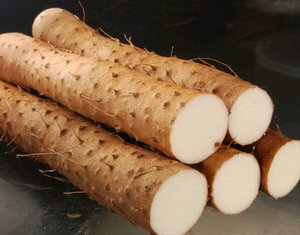 The story of the Chinese yam is another example of a significant question being asked of Steiner that led on to new research and knowledge. I’m indebted for the following account to Hannah Townsend’s review of Ralf Roessner’s book The Light Root in the Autumn 2014 issue of New View magazine (article not online). Well, who could resist following up on such an intriguing story? Certainly not the anthropopper, who promptly went out and bought a copy of The Light Root by Ralf Roessner (£8.99 from Temple Lodge Publishing, ISBN 978 1 906999 63 6). Here of course we dive straight into controversy: what is this light ether, which most scientists, if asked, would say does not exist? Those who are familiar with Steiner’s concepts will know that he thinks in terms of a spectrum of realities, from the physical to the etheric to various gradations of the spiritual. Living organisms which have a physical body or form also have an etheric body or form, which is essentially an energy body that contains and forms the physical. It is this etheric body which maintains the physical body’s form until death. According to Steiner, the etheric body is made up of four ethers: warmth ether, light ether, chemical/sound ether and life ether (he said that there are in fact seven ethers but only four of them are currently susceptible to investigation). Materialists won’t go along with any of this, of course. However, two researchers, Dennis Milner and Edward Smart, in their work with Kirlian-type photography, seem to have been able to detect the four ethers identified by Steiner. My friend, Dr Siegfried Trefzer, has also used Kirlian photography as a means to detect illnesses in the etheric body before they manifest in the physical body. Between them, the etheric and physical bodies contain the meridian lines and acupuncture points which create a structured and permeable web of energy that helps to maintain the health of our physical body. This level can be weakened by various factors including: electromagnetic pollution, poor diet, drug misuse, trauma, sedentary lifestyle, genetic factors etc. From all this, it is clear that the medicine of the future will have to encompass energy medicine if real progress is to be made in treating pain and disease. I can remember staying in a boarding house at Cliftonville with my parents when I was a young boy. On the table next to ours at breakfast was a man who had an artificial leg below one knee, which was of course fascinating to me. I have never forgotten how he said that he was having pain, not where the artificial limb joined his leg, but below this – where the amputated leg had been. This phantom limb effect is another example of the etheric body. Even when the limb has been removed, sensation can be felt as if it were still there, because the etheric form of the limb is still there. Anyway, back to Ralf Roessner’s book about the Chinese yam or, as he calls it, the “light root”, a term he has patented in Germany as “lichtwurzel”. Roessner found that he had to go to the original growing areas in China to find suitable plants, as the specimens he had got from France, Africa and America did not show anything like the expected light ether qualities. The ability to store light ether in the plant is dependent on growing the plant at a sufficient depth (the tubers need to be at least four feet deep) as tubers grown near the surface do not have the same qualities at all. 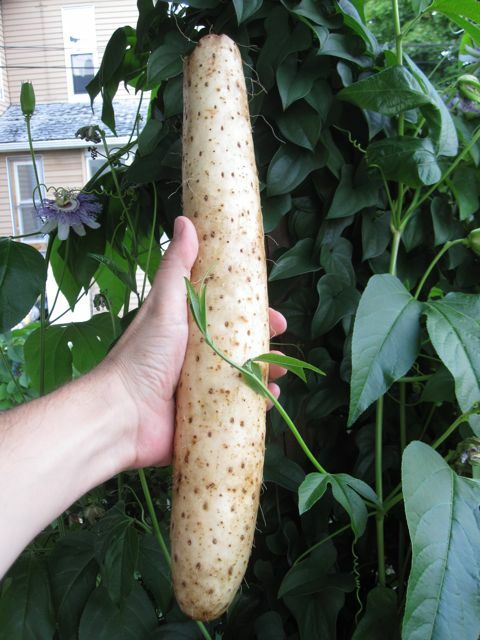 In addition, it is only the male plants of the Chinese yam which have the ability to store the light ether. At harvest time, according to Roessner, these tubers have a radiance that is noticeable even to the untrained observer. One can see why he should be cautious – he claims that the light root was rescued from Atlantis and brought to China, that the light root is a plant which nourishes yin or what Steiner calls the Venus principle, that to describe the effect of the light root on the human being requires faculties which go beyond ordinary sense-perceptible observation. He says that the light root’s unique light ether potential is able directly to strengthen the body’s formative forces (ie the etheric body), which is thereby enabled to take up with more ‘clarity’ those cosmic formative forces which underlie all earthly growth processes. Roessner sees the light root as providing an intermediate stage between a light nutrition of the future and our current one-sidedly materialist nutrition which is becoming less and less capable of truly nourishing us. What is more, the light root does have the potential to be a popular staple food: it is apparently delicious, makes good chips, and can be used in soups, sauces, pies etc. It has the property of filling you up with a small amount, so would be good for slimmers, as well as an excellent food for people with little money. It even has a beautifying effect, bestowing smooth, silky skin and shiny, strong hair. So, yes, I can see the Monsantos or Nestles of this world spotting vast commercial opportunities further down the line. How would you like your light root cooked? Chipped, fried, in a soup or sauce? In the meantime, Ralf Roessner is doing his best to promote light root products on his website (German language only). Processing the light root so as to preserve the light ether it contains has its challenges, as the magnetic field associated with electricity soaks up the light ether quality. Even the fan in a conventional oven causes damage, while microwaves completely destroy the quality of light ether. Roessner says that there is an urgent need to develop appliances such as graters, mills and mixers, where a motor can be installed away from the actual appliance. Clearly at present it is best to use the light root as a fresh food. It may be, of course that we in the West are not yet ready to swap the potato for the Chinese yam and it is therefore the role of people like Ralf Roessner and his colleagues to research and to keep the knowledge alive until that time when we begin to awaken from our deep materialistic sleep. In this, they deserve our thanks and respect for ploughing their lonely furrow on behalf of the future. How did Steiner know all this stuff? And where are the true scientists who, even if something does not fit within their current paradigm (or especially because it does not fit within the current paradigm), will say: ”We must look into these matters and if necessary, we must develop new theories, methods and techniques to enable us to do so.” Those are subjects that the anthropopper will return to in future postings. Hi Magic E and thank you for that very interesting link. I, too, would love to try some yam chips and hope to be able to organise a tasting before too long. Please see my reply to Caroline Kelly below. Glad to see you are still posting. Very interesting about the Yam. Can it grow in the UK climate? I have actually eaten some raw, it has a slippery texture, and not much flavour which is fine for something that is to replace the potato or starch element in our diet. A friend brought one back from Hungary. It sounds like it will be hard to grow on a big scale. Lovely to hear from you! I’ve been in touch with the British publishers of Ralf Roessner’s book and the good news is that he may well be coming over here to give some talks. I’ve suggested that if he does so, then it would be great to organise some cooked yam tasting opportunities as part of them! I’m told that it’s not a good idea to touch with bare skin the mucilaginous texture you refer to when the raw yam is cut, as some people can find it irritates the skin. But cooked it’s great! It could certainly be grown in the UK climate but needs careful cultivation in order to preserve the light ether qualities. Interestingly, the Chinese yam also produces quite large quantities of bulbils, like small potatoes, on the above-ground portions of the plant – and these are also delicious to eat. I should also have mentioned that Ralf Roessner very kindly gave me a large light root to take home and try – and I’m very happy to report that sautéed light root is absolutely delicious! I can really see that it does indeed have the potential to become a staple food on a par with the potato. my wife will visit our daughter in Houston in October 2017. If you don’t mind I could send with her some of these small bulbils. From them you can grow your own roots – so I did in Germany. With the exception of photos of or by others, or of the work of others, the content of this blog (anthropopper) may be shared and distributed non-commercially, in print or by email, if and only if any such content includes this copyright notice in full, as well as the full url(s) of the shared content. Content of this blog may not be posted, reposted, or embedded online, or used in fee-based workshops without my express permission. Links to anthropopper or to any of its content are welcome and much appreciated.